This past Sunday night was the last session for the class. Only six couples are allowed to be in each eighteen-week period. If you’re intereted, see Jackie or sign up at the back. The list should be available soon. It is not a guarantee that the class will be held on a Sunday. Nevertheless, it is a good time of learning and fellowship. We want to thank Brother Bernard for leading our first class! As busy as they are with other ministries in the church, they agreed to be together to encourage the class and Brother Bernard administer the sessions. Teddy bears and tea. This was such a cute and sweet theme. Sister Carol did a great job with the help of family members and church members to produce a lovely and fun-filled baby shower for Liz. We had a great time! -Last day of classes is May 16th. -Graduation and awards program will be held on May 20th during the evening service. Please bring light refreshments. The institute offers a through-the-Bible course for any interested in growing in the knowledge and understanding of the Word of God! Students can earn a Bible Degree in 3 years. Classes for Spring 2007 will be meeting once a week for 3 hours here at FBC. Times will be as follows: Fridays/Mondays at 7 PM and Saturdays at 7:30AM. -Old Testament Final exam will be held on May 18th, 19th, and 21st. -Fall ’07 applications are located at the back table in the foyer. Deadline for early enrollment for new students is May 31st. Please turn in applications to bro. Mike Castro. -There will be no class on May 20th due to the graduation and awards program. The mission trip teens will be having a yard sale at FBC on Saturday, May 26th from 7-10AM. Please bring items to FBC by 6:30AM. The men will be having a prayer breakfast at the Micronesian Mall Denny’s on May 26th at 6AM. Meetings will resume on May 26th at 9AM at FBC. See sis. Jeannine Hood for more information. The directory is currently being updated! Please see sis. Jackie for changes to your section of the directory. New members: Please see sis. Jackie to have your picture taken. If you haven’t turned in your membership form, please do so. Birthdays and anniversaries for the month of May will be celebrated on May 27th after the morning worship service. Please bring a dish. – Any male adult, teen, or 4th-6th grader may sign up to present a short devotional message during the noon worship service of May 27th. A sign-up sheet is located on the back table in the foyer. – Kuma’s fund raiser is scheduled to be at the Seafood Chef restaurant on Saturday, May 19th. Tickets are $20/ person. Please see sis. Anna for tickets. – No Master’s Club in July. – No VBS this year. – Harvest summer camp starts on July 16th for Jr. High and 23rd for Sr. high. We were blessed this Sunday with a special guest speaker, Jon Barr, from Silent Word Ministries during the morning and afternoon services. 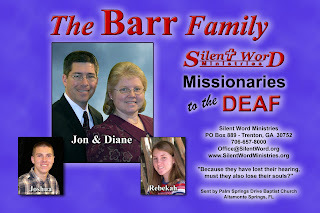 This week, brother Jon Barr will be ministering to the deaf church on island. This Sunday we were also blessed with a couple visitors who were visiting for the first time. The David Lavine family was visiting from Andersen Air Force Base. David is a communications officer for the Air Force. If the Lord would be pleased, we’d love to have them back! The institute offers a through-the-Bible course for any interested in growing in the knowledge and understanding of the Word of God. Students can earn a Bible Degree in 3 ears. Classes for Spring 2007 will be meeting once a week for 3 hours at the church building. The times will be Fridays/Mondays at 7 PM and Saturdays at 7:30 AM. – Old Testament Final exam will be held on May 18th, 19th, and 21st. – Fall 2007 applications are located at the back table in the foyer. Deadline for early enrollment for new students is May 31st. Please turn in applications to bro. Mike Castro. – Last day of classes is May 16th. – Graduation and awards program will be held on May 20th during the evening service. – If you plan on having your children attend next years, please fill out enrollment forms as soon as you can. At this time, only the enrollment forms are needed — payment need not be made at the time of submitting an enrollment form. – Men’s Prayer Meeting at Denny’s Micronesian Mall on May 26th at 6 AM. If you have any announcements that you’d like to place on this week’s church bulletin, please see Roslynne. She is taking over this wonderful help as Jackie is away until the 8th.